Server side software: it’s not just for hackers, folks! So many useful website platforms use software that runs on your server to do their work. So if you want to use these too, avoid frustration by making sure you’re prepared before you start. Say you want to install WordPress or Omeka on your server. These database-driven applications need you to do a little preparation before you can get them up and running. 1. Set up a URL or subdomain URL that you can load the software to run from. 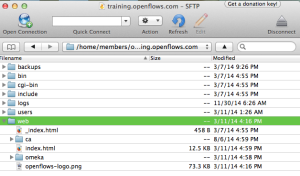 For example, I will be working off http://training.openflows.com in an open source cataloging workshop I teach. You might set up: catalog.yourwebsite.com if you were to make your own URL. You’ll need to be able to login to either your Domain Registrar or, more likely, your server’s cPanel to do this, so get those username and passwords out and navigate to *subdomain setup*. 2. Set up a database for each software. 3. 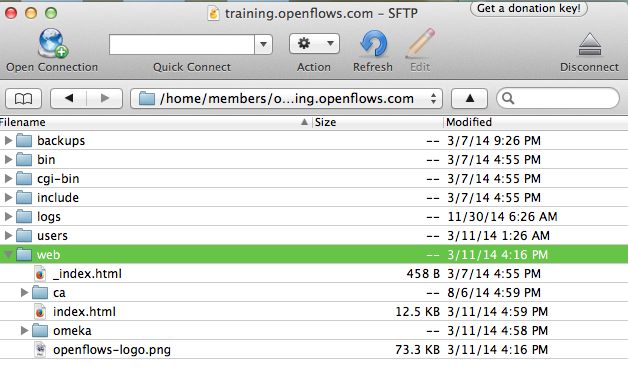 Make sure you can get files onto and then access files on your server. Either know how to ssh into & scp onto your server, or if you’re not in hacker school, make sure you have an FTP user account set up *and* an FTP software downloaded onto your computer. I like Cyberduck, but use whatever you’re familiar with. Final note: don’t email yourself usernames and passwords in the same email. Security risk! *Server access wtf? If you have server access this means that you, or someone who wants to be nice to you, pays for access to online storage. You will have an admin login and password for the server account, which is separate from the logins and passwords that control you getting to the files on your server. A server holds and can connect the files a website needs to run and display information to the WWW, or to a local network. A server is separate from –but connects to– a domain name [called the URL], which directs a browser to the files on a server using a name, called a path, to look for the files at.